the temperature is 80 degrees. While most of the country's ski resorts have closed down their winter and spring bill of fares in preparation for strictly summer activities, four Western resorts continue skiing, adding summer pursuits to their rich haute cuisine. Three plan to be open until at least July 4; one is the only resort open in North America the entire year. "I can't think of a finer recreation situation," says Timberline Lodge Director of Public Affairs, Jon Tullis, "than to be able to ski your heart out in the morning, relax at mid-day, then jump-start yourself in the afternoon with a wild windsurf ride across the Columbia River Gorge. A less rigorous afternoon undertaking could include a quiet forest hike, a round of golf, or coaxing trout to a fly on a stream or lake." Timberline, located conveniently 55 miles east of Oregons Portland International Airport, sits on majestic 11,245-foot Mount Hood. The resort has become an international destination for adventurers. Some of the best snowsport athletes in the world train at Timberline in the summer. It is a regular summer home to the United States and Canadian ski teams, along with some of the top European and Japanese athletes. Skiers like. Picabo Street, Bill Johnson and Tommy Moe, as well as snowboarders like Shawn Palmer and Ross Powers have trained here. Seventy-five percent of the summer mountain is training terrain and 25 percent is for recreation skiers. 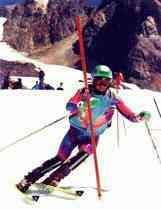 The perpetual Palmer snowfield at 8,500 feet offers quality skiing conditions. The public may also ski the moderate runs below the Palmer chair which run down to the Timberline Lodge, but it is recommended to ski these runs in the early morning, before they soften under the afternoon sun. Timberline closes at 1:30 p.m., but many snowboarders remain on the snowfield and continue boarding by hiking the slopes until the late afternoon. The Market Cafe at Timberline's Wy'east Day Lodge is a good mid-day stop. Alfresco dining is offered on the deck with barbecue fare, pasta dining, and a full bar. The Wy'east Kitchen offers cafeteria-style food. If you want to pamper yourself after an active day recreating, dine at Timberline's Cascade Dining Room, famous for its continental and Northwest fare, prepared under the direction of executive chef Leif Eric Benson, winner of several international culinary awards. If you're staying at Timberline Lodge, treat yourself to their large heated swimming pool and hydro spa. 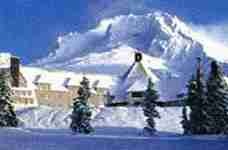 Timberline Lodge, now a National Historic Landmark, is the dean of mountain lodges. Ambling through its rustic doors is like stepping into a simpler, more elegant time when detail was the rule, not the exception. Music with a tropical beat resonates from the deck. The smell of mesquite barbecue wafts in the air, while bronzed, sun-glassed skiers wearing shorts and bikinis mill around with frothy cold drinks. Are we having fun yet? You bet, if you're relaxing on the Mill Cafe sundeck at Mammoth Mountain, after an invigorating morning of skiing perfect corn snow, between the 7,953-foot main lodge and the 11,053-foot summit. A variety of late spring and early summer terrain is available for the first-time beginner as well as the double diamond pursuers. The outer edges of the nine-mile wide mountain have been closed since Easter, but the heart of the mountain remains open as long as snow conditions allow. A great run from top to bottom is the groomed "Cornice Bowl" from the top of Panorama Gondola to "St. Anton" on to "Stump Alley" or "Broadway." Chairs 1, 3, and 23 are open from 7:30 a.m. to 3 p.m.
You dont need to be a skier to enjoy the spectacular High Sierra scenery. Many tourists ride the chair to admire the sights. Also, the Mammoth Mountain Adventure Park opens for mountain biking June 26 to September 26. It has over 70 miles of winding, forested single track for all abilities, and access to the 11,053-foot summit in late season. 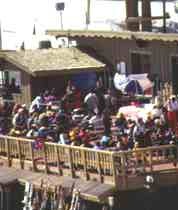 The 18-hole Sierra Star Golf club has its grand opening in June, 1999. The Sierra fishing season is already underway, with plenty of creeks, lakes, and the famous Owens River to choose from. yes, barbecue grills. Some wear cowboy hats; some are bare-chested. They're all wearing either ski or snowboard boots. The perfect binding for cowboy boots is yet to be perfected! They even play volleyball in their ski boots  at 11,000-feet. The Legend, as Colorado's Arapahoe Basin is called, revels in the rights of spring and early summer. The beach is the parking lot at the foot of North Americas highest lift-served terrain  Arapahoes snowy 13,050-foot mountain. Portable Jacuzzis are set up at the beach, as are sailboats for party venues. This year's Summer Solstice Splash takes place June 19. Any skier or snowboarder intrepid enough to ski across 50 yards of glacial-cold "Lake Reveal" wins a prize. The legends of skiing come here, as does an interesting subculture, defined by one Arapahoe press release as a "mixture of Dead Heads, football tailgate partiers, and a Broadway show cast." If it sounds like your kind of fun, be there. By the way, the classic Colorado corn snow skiing is great. Mount Bachelor is so optimistic about its snow totals (200-inch snow base, near 300-inch average snowfall) that it sells a season spring-summer Summit pass beginning in April ($263 in 1999). Though they cut back from a winter operating capacity of 13 lifts and 3,686 acres, to three lifts for the summer season, there is still plenty of enticing terrain available to ski and board. Views from on top the Summit take in three states  Oregon, Washington, and California. 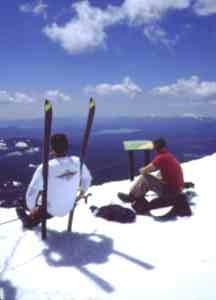 Skiers and boarders often become hypnotized by the grandeur of the Cascade Range scenery at the various vista points on the mountain. Sightseers are also welcome on the Summit Lift. 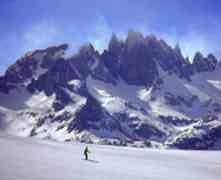 Many pack a lunch and linger, enjoying the far and away scenery, the pure mountain air, and the warm sun. Mount Bachelor and the Bend area is a cornucopia of summer activities. 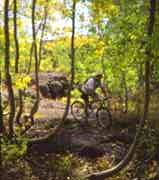 After a morning ski (lifts open from 7:30 a.m. to 1:30 p.m.), rent a bike and travel the lovely Deschutes River Trail. Arrange for an exhilarating white water rafting excursion, or play a round on one of Bend's verdant lava-country golf courses. Check in at Mount Bachelor's Merrell Hiking Center for a hike recommendation, or try out your new tennis racket. You can auto tour this magic land of pine and lava, or ply the quiet waters of one of the many Cascade fishing rivers, streams, or lakes. 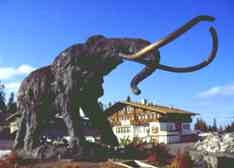 Mount Bachelor and environs is a Mecca for the outdoor enthusiast whether their pockets are plebian or replete. Click here for details to plan your Western summer ski adventure.